In a bowl, soak the raisins in the hot water for 20 minutes; drain. Stir in the sugars, flour, cinnamon, nutmeg, lemon zest, lemon juice and orange juice. Fold in the nectarines and plums. Scrape the fruit into a 9-by-13-inch glass baking dish. Cover with foil and bake for 15 minutes. In a bowl, combine the oats, flours, sugar, lemon zest and cinnamon. Work in the butter blend. Press the streusel into clumps and sprinkle over the fruit. 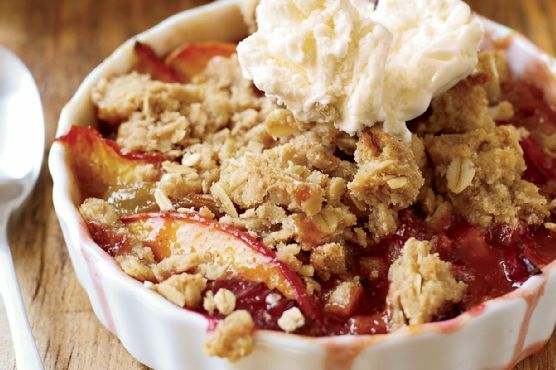 Bake the crisp for 30 minutes, until the fruit is tender and the topping is golden. Let cool for 20 minutes, then serve. Crisp can be paired with Cream Sherry, Moscato d'Asti, and Port. A common wine pairing rule is to make sure your wine is sweeter than your food. Delicate desserts go well with Moscato d'Asti, nutty desserts with cream sherry, and caramel or chocolate desserts pair well with port.